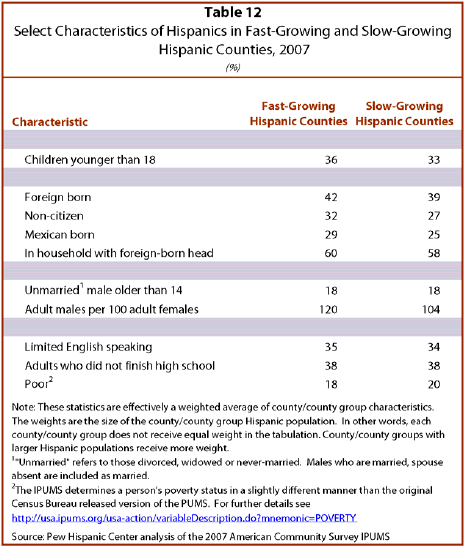 The fast-growing Hispanic county/county groups have many more adult male Hispanics relative to adult female Hispanics in comparison to the slow-growing areas. In the slow-growing Hispanic county/county groups, there were 104 adult male Hispanics for every 100 adult female Hispanics. In the fast-growing Hispanic counties, there were 120 adult male Latinos for every 100 adult female Latinos. Mainly because of immigration from Mexico, Latinos in the new settlement areas are more likely to be foreign born than their counterparts in slow-growing county/county groups. Hispanics in the new settlement areas are also less likely to be U.S. citizens. The age structure and social profile of Hispanics in the new settlement areas resembles that of slower-growing areas. In both areas, about one-third of the Hispanic population are children. About one-third of Latinos in both areas report speaking English with difficulty. Nearly four-out-of-ten Hispanic adults in both areas have not completed high school. About one-fifth of Hispanics in each area live in poverty. Hispanics in the fast-growing county/county groups, on average, have very different characteristics than non-Hispanics residing in those same areas (Table 13). One-in-three Latinos in the new settlement areas are children, compared with one-in-four non-Hispanics. The non-Hispanic population is overwhelmingly native born and has citizenship. Fewer than one-in-ten non-Hispanics in the fast-growing areas reside in an immigrant-headed household, compared with six-in-ten Latinos. The gender balance between Hispanics and non-Hispanics diverges considerably in the new settlement areas. Among the non-Hispanic population are 93 adult males for every 100 adult females. 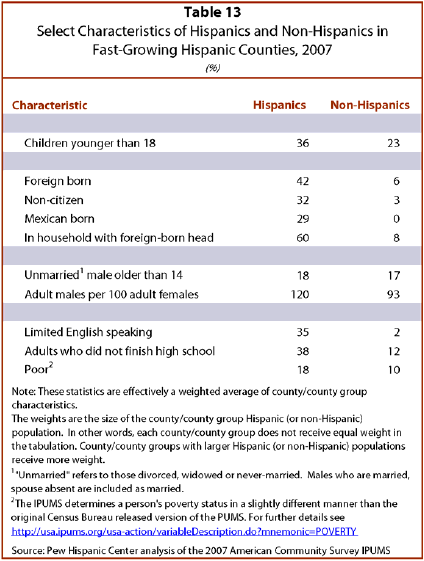 Among Hispanics, adult males outnumber adult females. Non-Hispanics in the new settlement areas overwhelmingly report that they speak only English at home or speak English at least “very well.” A sizable minority of Latinos (35%) in these areas do not report these levels of English proficiency. Latino adults in the new settlement areas also trail their non-Hispanic counterparts in educational attainment. Nine-in-ten non-Hispanics have at least completed high school, compared with six-in-ten Hispanics. Likely reflecting in part their youth, lower English proficiency and formal education, Hispanics in the new settlement areas are nearly twice as likely as their non-Hispanic neighbors to live in poverty.